Those in the West Midlands area looking for a high-quality, high-value pick-up vehicle can now experience first-hand the new Great Wall Steed – the first Chinese vehicle to go on sale in the UK - as the manufacturer has appointed Tredington-based Cross Roads Garage as an official dealer. Located near Shipston-on-Stour, the dealership is around 30 miles from Worcester, Coventry and Oxford. Joining Great Wall’s established network of more than 50 outlets in the UK, Cross Roads Garage will begin with sales of the Steed pick-up and provide owners with dedicated parts and service facilities. Cross Roads Garage Managing Director Jon Mathers started working at Cross Roads back in 1985 in the parts department, before turning his hand to sales. 28 years and 4,500 car sales later, he is now the owner of the largest Subaru dealership group in the UK. With four national awards for customer service and automotive excellence, Cross Roads Garage is already well known amongst the community for its new and quality used car sales and its service and repair centre, both of which will continue alongside its new partnership with Great Wall. Cross Roads Garage’s extensive experience of operating in the local area means that the dealership has a thorough understanding of the needs of businesses and consumers in the Shipston-on-Stourarea. Expectations are high that the Steed pick-up will prove popular amongst trade and recreational users alike. The generously equipped Steed is already attracting interest from buyers of both new and used pick-ups across the UK, thanks to its combination of robustness, practicality and unrivalled value, with prices starting from £13,998 (CVOTR). 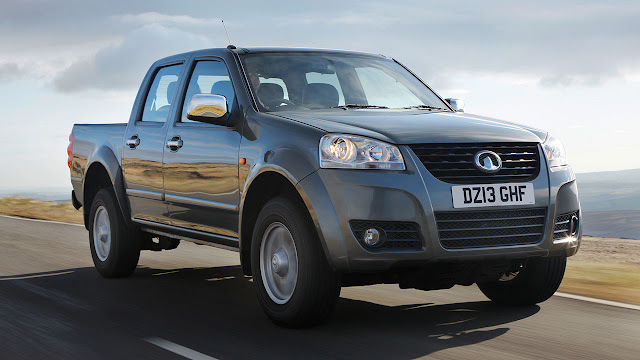 Not only is it the most affordable 4x4 double-cab pick-up to buy, but it is also the most economical to run. Powered by a newly-developed 2.0-litre, 16-valve turbocharged diesel engine, the Steed delivers class leading fuel economy of 34.0 mpg (combined). It also has best-in-class insurance ratings – 7A for the Steed S and 8A for the range-topping Steed SE. “Cross Roads Garage has been following the development of Great Wall in the UK closely, even prior to launch in 2012. Having evaluated the Steed first-hand, we are greatly impressed with its build quality and the aftercare and support that Great Wall offers; we strongly believe that it represents excellent value for money. We’re incredibly excited and proud to join Great Wall in the early stages of its history in the UK and to introduce the Steed to the community in Tredington and the surrounding area,”says Jon Mathers. So that the buying and ownership experience of a Steed is as rewarding and trouble-free as possible, all dealers – including Cross Roads Garage – have committed to the ‘Great Wall Promise’ which includes inflation-proof servicing plans and free service pick-up and drop-off. All Steeds now come with a six-year / 125,000 warranty – the only vehicle in its segment to do so. For further details about Great Wall call Jon Mathers on 0844 662 6864 or visit the dealership at Tredington, Shipston-on-Stour, Warwickshire, open from 08:30am to 18:00 Monday to Friday, and 09.00am to 17.00 on Saturday.